Sky has explained that a big factor in screening the eagerly anticipated HBO drama Game of Thrones just a day after it is shown in the US is to cut down on piracy. 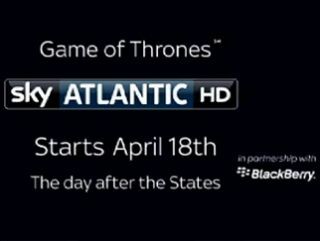 Sky Atlantic will premiere Game of Thrones – based on the George R.R Martin novels - on 18 April, just a matter of hours after it is screened in the US. It's an increasingly common occurrence – with event television like the finale of Lost screened simultaneously for those who decided to stay up and get to find out the ending at the same time rather than have it spoiled. And David Wheeldon, the company's director of policy and public affairs has sensibly pointed out that it cuts down on piracy when people have a legal and readily available alternative to see their favourite US shows. "It's entirely understandable that fans of a particular series will want to watch it as close to its original transmission as possible," blogged Wheeldon. "It's therefore important that content owners and distributors respond to this by making programmes available at a time that is appealing and convenient for local viewers. "At Sky we're certainly trying our best to do this where we can, but do acknowledge that there are still some notable exceptions, resulting from commercial constraints. But we're looking to reduce these as we move forward. "With this in mind, closing the gap between US and UK transmission helps eliminate one of the reasons why a small minority of consumers may be tempted to view content from illegitimate sources." It's a sensible opinion – after all, who would go to the trouble of torrenting a show when they can get hold of it in an easier way?